The all-inclusive petition entitled, “Prohibit Any Laws Mandating the Force and Requirement of Vaccinations of Any Kind,” appeared on the “We the People” site earlier this month, and has already managed to garner some 34 thousand signatures. “No human being should be FORCED to be vaccinated against their will and/or personal/religious beliefs,” reads the petition’s text. The appeal is a response to the wave of vaccine hysteria that swept the nation following the highly-publicized Disneyland measles outbreak, which affected up to nine people who had allegedly contracted the disease via visitors from foreign countries. Little reported, of course, was the fact that of those nine people, five had been vaccinated, according to The Los Angeles Times. The “Mickey Mouse measles” fear campaign led to neurotic calls for anti-vaccination parents to be jailed, while lawmakers from such states as California and Washington floated legislation to do away with personal vaccine exemptions, regardless of religious or moral objections. We strongly oppose the proposed Emergency Health Powers Act, introduced as [NY state] Assembly Bill 9508. Let me explain why. It is unprecedented in divesting power from the legislature, from this very committee, to the governor. The draft legislation gives the governor absolute authority for 60 days, with the legislature powerless during that period. Section 1024(3) divests the legislature of its power for a period of 60 days after a declaration of a health emergency by the governor. This is a completely irrational – and unconstitutional — deprivation of legislative authority and responsibility. There is no justification for this shift in power from one branch of government to another. It means that a 2/3rd vote of the legislature cannot stop the governor during the 60 day period. Not even a unanimous vote of the legislature can do anything…. Why is the CDC asking state legislatures to give up their power in this unprecedented manner, when Congress itself would not and should not give up such power? The scope of the draft legislation goes far beyond bioterrorism. It includes every disease “that poses a substantial risk of a significant number of human fatalities or incidents of permanent or long-term disability.” Section 1020. Lyme disease in New York could be the basis for a declaration of a state of public health emergency by the governor under the draft bill. Likewise, Hepatitis B or any other widespread illness could be cited in declaring a health emergency. The bill uses a definition of “infectious disease” that broadly includes virtually everything. It is defined to mean “a disease caused by a living organism … [that] may, or may not, be transmissible from person to person, animal to person, or insect to person.” Section 1003(6). That sweeps far too much within the ambit of the legislation. Based on that definition, the governor could force everyone either to take the recently discontinued Lyme disease vaccine, or the Hepatitis B vaccine, or virtually any other vaccine. The bill states that: The department may … compel a person to be vaccinated and/or treated for an infectious disease.” Section 1043 & (1). No exceptions are in the bill for religious conviction or conscience. The only medical exemption from the vaccine is “if the department has reason to know that a particular individual is likely to suffer from serious harm from the vaccination.” Section 1043(1)(b). So the individual must have a greater than 50% chance of being seriously injured, in the view of the department, which is not legally liable if it is negligent. Less than a 50% chance of serious injury does not qualify for the exception. We have just seen a striking difference between the choices that individuals make about vaccination, in the face of a bioterrorist threat, compared to the views of health departments. The anthrax vaccine was declared safe and effective by the government, and there was a program requiring everyone in the military to take the vaccine. Soldiers who declined it were subjected to court martial. After the anthrax attack hit, the vaccine was provided to postal workers and members of the media. Only about 2% elected to be vaccinated. Under the draft legislation, the governor could simply order everyone to be inoculated by the anthrax or other vaccine. The manufacturer’s incentive to improve the safety of the vaccine is lost if everyone is forced to take it. We oppose many other provisions of the proposed legislation. If the health department, in its sole discretion, wants someone quarantined, it would be able to do so without adequate due process. It could order people out of their homes into dangerous quarantines, where there would be no guarantee of safety from violence or contagious disease. Children could be removed from parents, and thrown into public quarantines with others. George Annas, Chairman of the Health Law Department at the Boston University School of Public Health, noted that “this law treats American citizens as if they were the enemy.” Citizens, and the legislature, can respond well to bioterrorism and other health crises under existing law. The anthrax attack did not even persuade 98% of postal workers and the media to take the vaccine. The Association of American Physicians and Surgeons (“AAPS”) opposes the Emergency Health Powers Act. We urge the legislature to defend its constitutional authority and responsibility in this area, and not grant these enormous powers to the state health department. There’s a reason 98% of postal workers refused the anthrax vaccine. They remembered what happened to US soldiers in the afghan and iraq wars (gulf war syndrome) due to an experimental adjuvant http://www.ncbi.nlm.nih.gov/pubmed/12127050 which the US government continues to deny was present in the anthrax vaccine, just as they pretend people haven’t figured out the implications of the fact that the anthrax spores which were mailed to the 2 main opponents of the patriot act in 2001, complete with letters praising jihad and allah, came from a US bioweapons lab http://whatreallyhappened.com/WRHARTICLES/frameup.html . What does that tell you about 9/11 all by itself? And today the CDC continues to deny that vaccines can cause autism, they don’t even bother to screen kids for glutathione deficiency which is apparently 100% accurate in predicting vulnerability to autism http://www.phschool.com/science/science_news/articles/blood_hints_autism.html before injecting them with vaccines that still contain mercury http://vaccinesafety.edu/thi-table.htm and aluminum http://www.vaccinesafety.edu/components.htm . Perhaps they need a “bioterrorist attack” to bring people into line. It seems the 9/11 psyop is running out of steam. Watch this interview with Edward Snowden, conducted by New York Times columnist David Carr just last week. Carr tragically passed away just hours after he hosted this. Take a moment to enjoy this instance of real journalism, Snowden’s defense of his actions, and how he believes they were done in the spirit of patriotism. Good morning and welcome to the International Connection once again. This is a continuation of a radio series on mind control that we are bringing you here. We heard, for the last five weeks, a lecture and interview by Dr. Colin Ross, detailing the history of CIA mind control experimental programs that have been documented in material obtained under the Freedom of Information Act. What we are going to hear today is the mind control testimony that was introduced into the Presidential Advisory Committee on Human Radiation Experiments on March 15, 1995. President Clinton has apologized and compensated some of the victims of the radiation experiments. At the end of the hearing however, Valerie Wolf, Claudia Mullen and Christine deNicola gave their testimony about mind control experiments and linked in with the radiation experiments. We are going to hear the testimony that was given to the Advisory Committee in the second half of the show. In the first half, we are going to hear Claudia Mullen talk about the experience of giving testimony at the Presidential hearings. Claudia is a survivor of CIA mind control experimentation for many years, and got introduced to this through Tulane University, and we heard Colin Ross talk about Tulane’s involvement in the mind control programs in previous weeks’ broadcasts here. It is extremely brave of these women to come forward, and they really, in effect, broke the silence for many survivors. You are listening to 88.l, CKLN. The complete CKLN series (audio and transcripts) is online above. public health concern. Dysfunctional immunity and impaired brain function are core deficits in ASD. Aluminum (Al), the most commonly used vaccine adjuvant, is a demonstrated neurotoxin and a strong immune stimulator. Hence, adjuvant Al has the potential to induce neuroimmune disorders. When assessing adjuvant toxicity in children, two key points ought to be considered: (i) children should not be viewed as “small adults” as their unique physiology makes them much more vulnerable to toxic insults; and (ii) if exposure to Al from only few vaccines can lead to cognitive impairment and autoimmunity in adults, is it unreasonable to question whether the current pediatric schedules, often containing 18 Al adjuvanted vaccines, are safe for children? By applying Hill’s criteria for establishing causality between exposure and outcome we investigated whether exposure to Al from vaccines could be contributing to the rise in ASD prevalence in the Western world. Our results show that: (i) children from countries with the highest ASD prevalence appear to have the highest exposure to Al from vaccines; (ii) the increase in exposure to Al adjuvants significantly correlates with the increase in ASD prevalence in the United States observed over the last two decades (Pearson r = 0.92, p b 0.0001); and (iii) a significant correlation exists between the amounts of Al administered to preschool children and the current prevalence of ASD in seven Western countries, particularly at 3–4 months of age (Pearson r = 0.89–0.94, p=0.0018–0.0248). The application of the Hill’s criteria to these data indicates that the correlation between Al in vaccines and ASD may be causal. Because children represent a fraction of the population most at risk for complications following exposure to Al, a more rigorous evaluation of Al adjuvant safety seems warranted. MIT scientist Stephanie Seneff speaks out. A more in-depth video at the link below. She states that if the current trend holds, 50% of american children born in 2025 will be autistic. 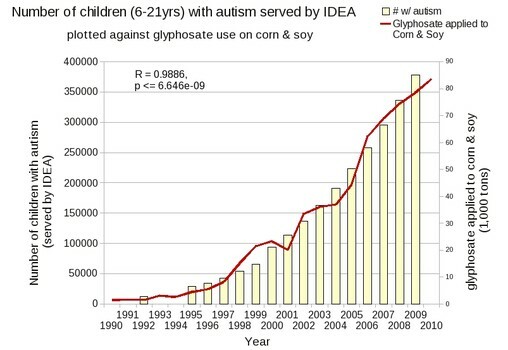 The number of children diagnosed with autism in America has risen alarmingly over the past fifteen years, in exact step with the rise in the use of glyphosate (Roundup) on corn and soy crops. Coincidence? I think not. In parallel, children in the United States have been burdened with an increased aluminum load from the world’s most comprehensive vaccination schedule. Glyphosate has a number of known biological effects that align with the known pathologies associated with autism. Glyphosate also likely promotes aluminum uptake into the tissues. Aluminum, a well-documented neurotoxin, is the established cause of dialysis dementia. I propose that aluminum accumulation in the brain, synergistically promoted by glyphosate, is the principal cause of autism in the US. Pump up your diet with foods rich in manganese, such as: Brazil nuts, cocoa/cacao, rice bran, cashews, quinoa, pumpkin seeds, almonds. Get plenty of vitamin D (at least 2000 IU/day, a typical dose from 30 minutes shirtless in the sun if you’re caucasian) to reduce toxin induced oxidative stress, to which neurons are partcularly vulnerable. “For instance, Issam Hattito, head of Muslim Brotherhood responsible for leading the battles against Bashar Assad, where does he reside? Is he in Beirut? Riyadh or Cairo? He’s residing in Tel Aviv.